The Sony CFexpress Type B memory card and the CFexpress Card Reader will be in the market in early summer 2019. 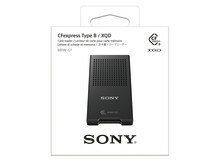 Enhancing Sony’s high performance, value-added memory card line-up, the CFexpress Type B is designed based on a new specification which adopts the latest interface, PCIe® (3) Gen3, standardised by the CompactFlash Association. 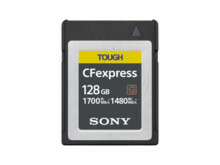 The Sony CFexpress Type B memory card offers a 128GB capacity, with higher capacity models of 256 GB and 512 GB planned for the future. The Sony CFexpress Type B memory card is around 3 times faster than Sony’s fastest CFast memory card (with 530MB/s read speed). With a write speed of up to 1480MB/s, this cardmeets future requirement needs for secure industry data-recording or requirements from professionals to capture hi-resolution images or high-bitrate video. With an ultra-fast read speed of up to 1700MB/s, even large-sized data files can be transferred quickly, when compared to existing memory cards. For example, when making copies or backing up large-sized data from multiple memory cards, transfer time will be dramatically reduced. This greatly improves work efficiency. The new CFexpress Card Reader, MRW-G1, is optimised for Sony CFexpress Type B memory card and takes full advantage of the card’s fast read speed. 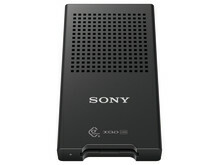 This reader is also compatible with Sony XQD card G series and M series. 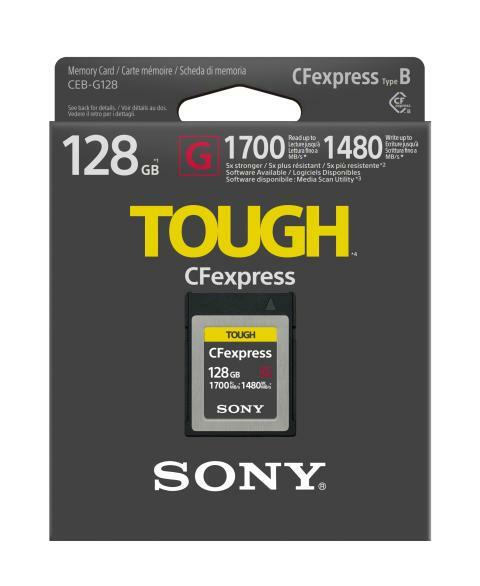 The Sony CFexpress Type B memory card has superior strength, surpassing the CFexpress standard by a factor of three, being able to withstand 70N of force in bend, and five times greater withstanding falls from up to 5m high. The card is also temperature proof, X-ray proof, anti-static and has a UV guard so it can perfectly support usage in tricky or tough environments. Media Scan Utility and Memory Card File Rescue are available as a free download to Sony CFexpress card users. Media Scan Utility is PC software that automatically scans your Sony CFexpress memory card every time you connect it to a PC via your MRW-G1 card reader (4). The software keeps you informed of the condition of your card and lets you know if you’re nearing or have reached the flash memory limit. Memory Card File Rescue eradicates every photographer’s worst nightmare – deleting photos accidentally and losing your precious work. The software recovers accidentally deleted files including RAW or high-resolution images and videos, so your work is safe from whatever obstacles are thrown your way. The Sony CFexpress Type B memory card and the CFexpress MRW-G1 Card Reader will be on the market in early summer 2019. (1) Based on Sony internal testing. Actual performance may vary and is dependent on environment and usage. (2) Based on memory card standard announced from the CompactFlash Association in 2017 as the next generation of XQD memory card and CFast memory card. CompactFlash is a trademark of CompactFlash Association. (3) PCIe is a registered trademark of PCI-SIG. (4) MRW-G1 is required to scan Sony CFexpress memory card.